Bleadon Christmas Market is a friendly mixed festive event with a Somerset village atmosphere selling local produce: meat, cheese, fruit and 'in season' vegetables, plants, flowers, preserves, breads, cakes, etc. Also crafts, books, jewelery, antiques, collectables, bric-a-brac, pet products and much more! 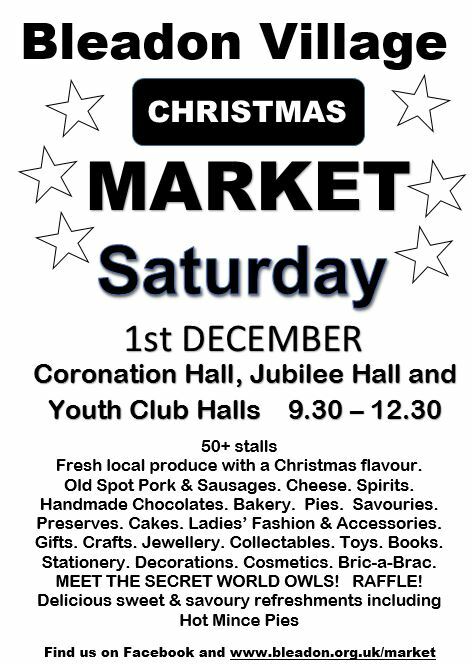 There is something for everyones christmas stocking so, please see the festive stallholder listings below for more details and there is also a Community Cafe, selling hot and cold drinks, snacks and perhaps a mince pie or two! Secret World Wildlife Rescue Meet the Owls! in the Coronation Hall & Jubilee Room, Bleadon, BS24 0PG, from 9.00am - 12.30pm. The Bumper Christmas Market is always on the first Saturday in December, held in the three halls on the village green.